Barbecued pork used to be my husbands favorite food before we became vegan. It was the thing that he missed the most as well. I was really happy to find a vegan rib recipe that was really good and easy to make. I used that recipe to make the “pork” sandwiches. 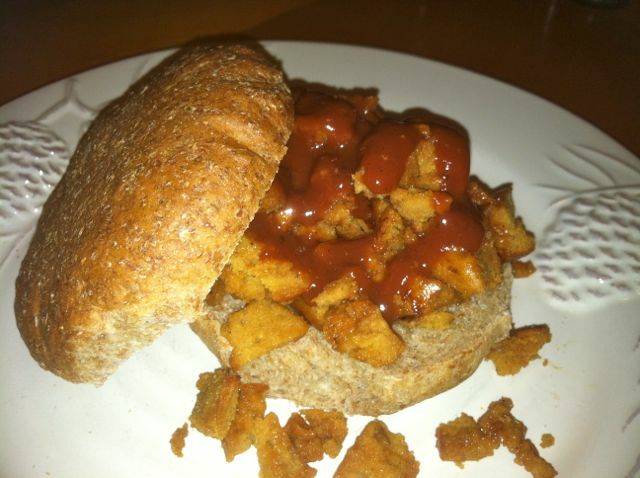 I just chopped the “ribs” covered it in BBQ sauce and served it on a whole wheat bun. The Collard Green Salad goes great with this sandwich. Follow the directions for the seitan ribz. When the ribz are done then chop them up and mix in some BBQ sauce. Serve on warm buns.